The mission was originally planned as Apollo 9, to be performed in early 1969 as the second test of the complete Apollo spacecraft, including the Lunar Module and the Command/Service Module in an elliptical medium Earth orbit. But when the Lunar Module proved unready to make its first test in a lower Earth orbit in December 1968, it was decided in August to fly Apollo 8 in December as a more ambitious lunar orbital flight without the Lunar Module. This meant Borman's crew was scheduled to fly two to three months sooner than originally planned, leaving them a shorter time for training and preparation, thus placing more demands than usual on their time and discipline. Apollo 8 took three days to travel to the Moon. It orbited ten times over the course of 20 hours, during which the crew made a Christmas Eve television broadcast where they read the first 10 verses from the Book of Genesis. At the time, the broadcast was the most watched TV program ever. Apollo 8's successful mission paved the way for Apollo 11 to fulfill U.S. President John F. Kennedy's goal of landing a man on the Moon before the end of the 1960s. The Apollo 8 astronauts returned to Earth on December 27, 1968, when their spacecraft splashed down in the Northern Pacific Ocean. The crew was named Time magazine's "Men of the Year" for 1968 upon their return. This crew was unique among pre-shuttle era missions in that the commander was not the most experienced member of the crew, as Lovell had flown twice before, on Gemini VII and Gemini XII. This was also the first case of the rarity of an astronaut who had commanded a spaceflight mission subsequently flying as a non-commander, as Lovell had previously commanded Gemini XII. On a lunar mission, the Command Module Pilot (CMP) was assigned the role of navigator, while the Lunar Module Pilot (LMP) was assigned the role of flight engineer, responsible for monitoring all spacecraft systems, even if the flight didn't include a Lunar Module. Edwin "Buzz" Aldrin was originally the backup LMP. When Lovell was rotated to the prime crew, no one with experience on CSM-103 (the specific spacecraft used for the mission) was available, so Aldrin was moved to CMP and Fred Haise brought in as backup LMP. Neil Armstrong went on to command Apollo 11, where Aldrin was returned to the LMP position and Collins was assigned as CMP. Haise was rotated out of the crew and onto the backup crew of Apollo 11 as LMP. The Earth-based mission control teams for Apollo 8 consisted of astronauts assigned to the support crew, as well as non-astronaut flight directors and their staffs. The support crew members were not trained to fly the mission, but were able to stand in for astronauts in meetings and be involved in the minutiae of mission planning, while the prime and backup crews trained. They also served as CAPCOMs during the mission. For Apollo 8, these crew members included astronauts John S. Bull, Vance D. Brand, Gerald P. Carr, and Ken Mattingly. The mission control teams on Earth rotated in three shifts, each led by a flight director. The directors for Apollo 8 included Clifford E. Charlesworth (Green team), Glynn Lunney (Black team), and Milton Windler (Maroon team). The triangular shape of the insignia symbolizes the shape of the Apollo Command Module (CM). It shows a red figure-8 looping around the Earth and Moon representing the mission number as well as the circumlunar nature of the mission. On the red number 8 are the names of the three astronauts. The initial design of the insignia was developed by Jim Lovell. Lovell reportedly sketched the initial design while riding in the backseat of a T-38 flight from California to Houston, shortly after learning of the re-designation of the flight to become a lunar-orbital mission. The graphic design of the insignia was done by Houston artist and animator William Bradley. Apollo 4 and Apollo 6 had been "A" missions, unmanned tests of the Saturn V launch vehicle using an unmanned Block I production model of the Apollo Command and Service Module in Earth orbit. Apollo 7, scheduled for October 1968, would be a manned Earth-orbit flight of the CSM, completing the objectives for Mission "C". Further missions depended on the readiness of the Lunar Module. Apollo 8 was planned as the "D" mission, to test the LM in a low Earth orbit in December 1968 by James McDivitt, David Scott and Russell Schweickart, while Borman's crew would fly the "E" mission, a more rigorous LM test in an elliptical medium Earth orbit as Apollo 9, in early 1969. But production of the LM fell behind schedule, and when Apollo 8's LM arrived at Cape Canaveral in June 1968, significant defects were discovered, leading Grumman, the lead contractor for the LM, to predict that the first mission-ready LM would not be ready until at least February 1969. This would mean delaying the "D" and subsequent missions, endangering the program's goal of a lunar landing before the end of 1969. George Low, the Manager of the Apollo Spacecraft Program Office, proposed a solution in August to keep the program on track despite the LM delay. Since the Command/Service Module (CSM) would be ready three months before the Lunar Module, a CSM-only mission could be flown in December 1968. Instead of just repeating the "C" mission flight of Apollo 7, this CSM could be sent all the way to the Moon, with the possibility of entering a lunar orbit. The new mission would also allow NASA to test lunar landing procedures that would otherwise have to wait until Apollo 10, the scheduled "F" mission. This also meant that the medium Earth orbit "E" mission could be dispensed with. The net result was that only the "D" mission had to be delayed. Almost every senior manager at NASA agreed with this new mission, citing both confidence in the hardware and personnel, and the potential for a significant morale boost provided by a circumlunar flight. The only person who needed some convincing was James E. Webb, the NASA administrator. With the rest of his agency in support of the new mission, Webb eventually approved the mission change. The mission was officially changed from a "D" mission to a "C-Prime" lunar-orbit mission, but was still referred to in press releases as an Earth-orbit mission at Webb's direction. No public announcement was made about the change in mission until November 12, three weeks after Apollo 7's successful Earth-orbit mission and less than 40 days before launch. With the change in mission for Apollo 8, Director of Flight Crew Operations Deke Slayton decided to swap the crews of the D and E missions. This swap also meant a swap of spacecraft, requiring Borman's crew to use CSM-103, while McDivitt's crew would use CSM-104. On September 9, the crew entered the simulators to begin their preparation for the flight. By the time the mission flew, the crew had spent seven hours training for every actual hour of flight. Although all crew members were trained in all aspects of the mission, it was necessary to specialize. Borman, as commander, was given training on controlling the spacecraft during the re-entry. Lovell was trained on navigating the spacecraft in case communication was lost with the Earth. Anders was placed in charge of checking that the spacecraft was in working order. Added pressure on the Apollo program to make its 1969 landing goal was provided by the Soviet Union's flight of some living creatures, including Russian tortoises, in a cislunar loop around the Moon on Zond 5 and return to Earth on September 21. There was speculation within NASA and the press that they might be preparing to launch cosmonauts on a similar circumlunar mission before the end of 1968. The Apollo 8 crew, now living in the crew quarters at Kennedy Space Center, received a visit from Charles Lindbergh and his wife, Anne Morrow Lindbergh, the night before the launch. They talked about how, before his 1927 flight, Lindbergh had used a piece of string to measure the distance from New York City to Paris on a globe and from that calculated the fuel needed for the flight. The total was a tenth of the amount that the Saturn V would burn every second. The next day, the Lindberghs watched the launch of Apollo 8 from a nearby dune. Of equal importance was the failure of three engines during flight. Researchers quickly determined that a leaking hydrogen fuel line ruptured when exposed to vacuum, causing a loss of fuel pressure in engine two. When an automatic shutoff attempted to close the liquid hydrogen valve and shut down engine two, it accidentally shut down engine three's liquid oxygen due to a miswired connection. As a result, engine three failed within one second of engine two's shutdown. Further investigation revealed the same problem for the third-stage engine—a faulty igniter line. The team modified the igniter lines and fuel conduits, hoping to avoid similar problems on future launches. The teams tested their solutions in August 1968 at the Marshall Space Flight Center. A Saturn stage IC was equipped with shock absorbing devices to demonstrate the team's solution to the problem of pogo oscillation, while a Saturn Stage II was retrofitted with modified fuel lines to demonstrate their resistance to leaks and ruptures in vacuum conditions. Once NASA administrators were convinced that the problems were solved, they gave their approval for a manned mission using SA-503. The Apollo 8 spacecraft was placed on top of the rocket on September 21 and the rocket made the slow 3-mile (5 km) journey to the launch pad on October 9. Testing continued all through December until the day before launch, including various levels of readiness testing from December 5 through 11. Final testing of modifications to address the problems of pogo oscillation, ruptured fuel lines, and bad igniter lines took place on December 18, a mere three days before the scheduled launch. As the first manned spacecraft to orbit more than one celestial body, Apollo 8's profile had two different sets of orbital parameters, separated by a translunar injection maneuver. Apollo lunar missions would begin with a nominal 100-nautical-mile (Template:Convert/LoffAonSon) circular Earth parking orbit. Apollo 8 was launched into an initial orbit with an apogee of 99.99 nautical miles (Template:Convert/round km) and a perigee of 99.57 nautical miles (Template:Convert/round km), with an inclination of 32.51° to the Equator, and an orbital period of 88.19 minutes. Propellant venting increased the apogee by 6.4 nautical miles (Template:Convert/round km) over the 2 hours, 44 minutes and 30 seconds spent in the parking orbit. This was followed by a Trans-Lunar Injection (TLI) burn of the S-IVB third stage for 318 seconds, accelerating the 63,531 lb (Template:Convert/round kg) spacecraft from an orbital velocity of 25,567 feet per second (Template:Convert/round m/s) to the injection velocity of 35,505 ft/s (Template:Convert/round m/s), which set a record for the highest speed, relative to Earth, that humans had ever traveled. This speed was slightly less than the Earth's escape velocity of 36,747 feet per second (Template:Convert/round m/s), but put Apollo 8 into an elongated elliptical Earth orbit, to a point where the Moon's gravity would capture it. The standard lunar orbit for Apollo missions was planned as a nominal 60-nautical-mile (Template:Convert/LoffAonSon) circular orbit above the Moon's surface. Initial lunar orbit insertion was an ellipse with a perilune of 60.0 nautical miles (Template:Convert/round km) and an apolune of 168.5 nautical miles (Template:Convert/round km), at an inclination of 12° from the lunar equator. This was then circularized at 60.7 nautical miles (Template:Convert/round km) by 59.7 nautical miles (Template:Convert/round km), with an orbital period of 128.7 minutes. The effect of lunar mass concentrations ("masscons") on the orbit was found to be greater than initially predicted; over the course of the twenty-hour mission, the orbit was perturbated to 63.6 nautical miles (Template:Convert/round km) by 58.6 nautical miles (Template:Convert/round km). Apollo 8 achieved a maximum distance from Earth of 203,752 nautical miles (Template:Convert/smi km). Apollo 8 launched at 7:51:00 a.m. Eastern Standard Time on December 21, 1968, using the Saturn V's three stages to achieve Earth orbit. The S-IC first stage impacted the Atlantic Ocean at Template:Coord and the S-II second stage at Template:Coord. The S-IVB third stage injected the craft into Earth orbit, but remained attached to later perform the trans-lunar injection (TLI) burn that put the spacecraft on a trajectory to the Moon. The Titan II launch vehicle used for the Gemini program had been notoriously rough-riding, and technicians promised the astronauts that the Saturn V, which was designed for the Apollo program rather than adapted from a missile, would have a much smoother ride. Lovell and Borman, both Gemini veterans, found this promise did not disappoint. During liftoff, they reported feeling nothing but a dull, muted rumble in the distance. Once the vehicle reached Earth orbit, both the crew and Houston flight controllers spent the next 2 hours and 38 minutes checking that the spacecraft was in proper working order and ready for TLI. The proper operation of the S-IVB third stage of the rocket was crucial: in the last unmanned test, it had failed to re-ignite for TLI. During the flight, three fellow astronauts served on the ground as Capsule Communicators (usually referred to as "CAPCOMs") on a rotating schedule. The CAPCOMs were the only people who regularly communicated with the crew. Michael Collins was the first CAPCOM on duty and at 2 hours, 27 minutes and 22 seconds after launch radioed, "Apollo 8. You are Go for TLI." This communication signified that Mission Control had given official permission for Apollo 8 to go to the Moon. Over the next 12 minutes before the TLI burn, the Apollo 8 crew continued to monitor the spacecraft and the S-IVB. The engine ignited on time and performed the TLI burn perfectly. After the S-IVB had performed its required tasks, it was jettisoned. The crew then rotated the spacecraft to take some photographs of the spent stage and then practiced flying in formation with it. As the crew rotated the spacecraft, they had their first views of the Earth as they moved away from it. This marked the first time humans could view the whole Earth at once. Borman became worried that the S-IVB was staying too close to the Command/Service Module and suggested to Mission Control that the crew perform a separation maneuver. Mission Control first suggested pointing the spacecraft towards Earth and using the Reaction Control System (RCS) thrusters on the Service Module (SM) to add 3 ft/s (Template:Convert/round m/s) away from the Earth, but Borman did not want to lose sight of the S-IVB. After discussion, the crew and Mission Control decided to burn in this direction, but at 9 ft/s (Template:Convert/round m/s) instead. These discussions put the crew an hour behind their flight plan. Five hours after launch, Mission Control sent a command to the S-IVB booster to vent its remaining fuel through its engine bell to change the booster's trajectory. This S-IVB would then pass the Moon and enter into a solar orbit, posing no further hazard to Apollo 8. The S-IVB subsequently went into a 0.99-by-0.92-astronomical-unit (Template:Convert/Gm) solar orbit with an inclination of 23.47° from the plane of the ecliptic, and an orbital period of 340.80 days. After the insertion into trans-Lunar orbit, the Saturn IVB third stage became a derelict object. It will continue to orbit the Sun for many years. The Apollo 8 crew were the first humans to pass through the Van Allen radiation belts, which extend up to 15,000 miles (Template:Convert/round km) from Earth. Scientists predicted that passing through the belts quickly at the spacecraft's high speed would cause a radiation dosage of no more than a chest X-ray, or 1 milligray (during a year, the average human receives a dose of 2 to 3 mGy). To record the actual radiation dosages, each crew member wore a Personal Radiation Dosimeter that transmitted data to Earth as well as three passive film dosimeters that showed the cumulative radiation experienced by the crew. By the end of the mission, the crew experienced an average radiation dose of 1.6 mGy. Jim Lovell's main job as Command Module Pilot was as navigator. Although Mission Control performed all the actual navigation calculations, it was necessary to have a crew member serving as navigator so that the crew could successfully return to Earth in case of communication loss with Mission Control. Lovell navigated by star sightings using a sextant built into the spacecraft, measuring the angle between a star and the Earth's (or the Moon's) horizon. This task proved to be difficult, as a large cloud of debris around the spacecraft formed by the venting S-IVB made it hard to distinguish the stars. By seven hours into the mission, the crew was about one hour and 40 minutes behind flight plan due to the issues of moving away from the S-IVB and Lovell's obscured star sightings. The crew now placed the spacecraft into Passive Thermal Control (PTC), also known as "barbecue" roll. PTC involved the spacecraft rotating about once per hour along its long axis to ensure even heat distribution across the surface of the spacecraft. In direct sunlight, the spacecraft could be heated to over 200 °C (Template:Convert/roundT0 °F) while the parts in shadow would be −100 °C (Template:Convert/roundT1 °F). These temperatures could cause the heat shield to crack or propellant lines to burst. As it was impossible to get a perfect roll, the spacecraft actually swept out a cone as it rotated. The crew had to make minor adjustments every half-hour as the cone pattern got larger and larger. The first mid-course correction came 11 hours into the flight. Testing on the ground had shown that the Service Propulsion System (SPS) engine had a small chance of exploding when burned for long periods unless its combustion chamber was "coated" first. Burning the engine for a short period would accomplish coating. This first correction burn was only 2.4 seconds and added about 20.4 ft/s (Template:Convert/round m/s) velocity prograde (in the direction of travel). This change was less than the planned 24.8 ft/s (Template:Convert/round m/s) due to a bubble of helium in the oxidizer lines causing lower than expected propellant pressure. The crew had to use the small RCS thrusters to make up the shortfall. Two later planned mid-course corrections were canceled as the Apollo 8 trajectory was found to be perfect. The Apollo 8 crew and Mission Control medical personnel held a conference using an unoccupied second floor control room (there were two identical control rooms in Houston on the second and third floor, only one of which was used during a mission). The conference participants decided that there was little to worry about and that Borman's illness was either a 24-hour flu, as Borman thought, or a reaction to the sleeping pill. Researchers now believe that he was suffering from space adaptation syndrome, which affects about a third of astronauts during their first day in space as their vestibular system adapts to weightlessness. Space adaptation syndrome had not been an issue on previous spacecraft (Mercury and Gemini), as those astronauts were unable to move freely in the comparatively smaller cabins of those spacecraft. The increased cabin space in the Apollo Command Module afforded astronauts greater freedom of movement, contributing to symptoms of space sickness for Borman and, later, astronaut Russell Schweickart during Apollo 9. By this time, the crew had completely abandoned the planned sleep shifts. Lovell went to sleep 32½ hours into the flight—3½ hours before he had planned to. A short while later, Anders also went to sleep after taking a sleeping pill. At about 55 hours and 40 minutes into the flight, the crew of Apollo 8 became the first humans to enter the gravitational sphere of influence of another celestial body. In other words, the effect of the Moon's gravitational force on Apollo 8 became stronger than that of the Earth. At the time it happened, Apollo 8 was 38,759 miles (Template:Convert/round km) from the Moon and had a speed of 3,990 ft/s (Template:Convert/round m/s) relative to the Moon. This historic moment was of little interest to the crew since they were still calculating their trajectory with respect to the launch pad at Kennedy Space Center. They would continue to do so until they performed their last mid-course correction, switching to a reference frame based on ideal orientation for the second engine burn they would make in lunar orbit. It was only 13 hours until they would be in lunar orbit. The last major event before Lunar Orbit Insertion (LOI) was a second mid-course correction. It was in retrograde (against direction of travel) and slowed the spacecraft down by 2.0 ft/s (Template:Convert/round m/s), effectively lowering the closest distance that the spacecraft would pass the moon. At exactly 61 hours after launch, about 24,200 miles (Template:Convert/round km) from the Moon, the crew burned the RCS for 11 seconds. They would now pass 71.7 miles (Template:Convert/round km) from the lunar surface. At 64 hours into the flight, the crew began to prepare for Lunar Orbit Insertion-1 (LOI-1). This maneuver had to be performed perfectly, and due to orbital mechanics had to be on the far side of the Moon, out of contact with the Earth. After Mission Control was polled for a "go/no go" decision, the crew was told at 68 hours, they were Go and "riding the best bird we can find". At 68 hours and 58 minutes, the spacecraft went behind the Moon and out of radio contact with the Earth. The SPS ignited at 69 hours, 8 minutes, and 16 seconds after launch and burned for 4 minutes and 13 seconds, placing the Apollo 8 spacecraft in orbit around the Moon. The crew described the burn as being the longest four minutes of their lives. If the burn had not lasted exactly the correct amount of time, the spacecraft could have ended up in a highly elliptical lunar orbit or even flung off into space. If it lasted too long they could have struck the Moon. After making sure the spacecraft was working, they finally had a chance to look at the Moon, which they would orbit for the next 20 hours. On Earth, Mission Control continued to wait. If the crew had not burned the engine or the burn had not lasted the planned length of time, the crew would appear early from behind the Moon. However, this time came and went without Apollo 8 reappearing. Exactly at the calculated moment, the signal was received from the spacecraft, indicating it was in a 193.3-by-69.5-mile (Template:Convert/round by Template:Convert/round km) orbit about the Moon. As they reappeared for their second pass in front of the Moon, the crew set up the equipment to broadcast a view of the lunar surface. Anders described the craters that they were passing over. At the end of this second orbit they performed the 11-second LOI-2 burn of the SPS to circularize the orbit to 70.0 by 71.3 miles (Template:Convert/round by Template:Convert/round km). Through the next two orbits, the crew continued to keep check of the spacecraft and to observe and photograph the Moon. During the third pass, Borman read a small prayer for his church. He had been scheduled to participate in a service at St. Christopher's Episcopal Church near Seabrook, Texas, but due to the Apollo 8 flight he was unable to. A fellow parishioner and engineer at Mission Control, Rod Rose, suggested that Borman read the prayer which could be recorded and then replayed during the service. When the spacecraft came out from behind the Moon for its fourth pass across the front, the crew witnessed "Earthrise" for the first time in human history (NASA's Lunar Orbiter 1 took the very first picture of an Earthrise from the vicinity of the Moon, on August 23, 1966). Borman saw the Earth emerging from behind the lunar horizon and called in excitement to the others, taking a black-and-white photo as he did so. In the ensuing scramble Anders took the more famous color photo, later picked by Life magazine magazine as one of its hundred photos of the century. Due to the synchronous rotation of the Moon about the Earth, Earthrise is not generally visible from the lunar surface. Earthrise is generally only visible when orbiting the Moon, other than at selected places near the Moon's limb, where libration carries the Earth slightly above and below the lunar horizon. Anders continued to take photographs while Lovell assumed control of the spacecraft so Borman could rest. Despite the difficulty resting in the cramped and noisy spacecraft, Borman was able to sleep for two orbits, awakening periodically to ask questions about their status. Borman awoke fully, however, when he started to hear his fellow crew members make mistakes. They were beginning to not understand questions and would have to ask for the answers to be repeated. Borman realized that everyone was extremely tired having not had a good night's sleep in over three days. Taking command, he ordered Anders and Lovell to get some sleep and that the rest of the flight plan regarding observing the Moon be scrubbed. At first Anders protested saying that he was fine, but Borman would not be swayed. At last Anders agreed as long as Borman would set up the camera to continue to take automatic shots of the Moon. Borman also remembered that there was a second television broadcast planned, and with so many people expected to be watching he wanted the crew to be alert. For the next two orbits Anders and Lovell slept while Borman sat at the helm. On subsequent Apollo missions, crews would avoid this situation by sleeping on the same schedule. As they rounded the Moon for the ninth time, the second television transmission began. Borman introduced the crew, followed by each man giving his impression of the lunar surface and what it was like to be orbiting the Moon. Borman described it as being "a vast, lonely, forbidding expanse of nothing". Then, after talking about what they were flying over, Anders said that the crew had a message for all those on Earth. Each man on board read a section from the Biblical creation story from the Book of Genesis. Borman finished the broadcast by wishing a Merry Christmas to everyone on Earth. His message appeared to sum up the feelings that all three crewmen had from their vantage point in lunar orbit. Borman said, "And from the crew of Apollo 8, we close with good night, good luck, a Merry Christmas and God bless all of you—all of you on the good Earth." The burn occurred exactly on time. The spacecraft telemetry was reacquired as it re-emerged from behind the Moon at 89 hours, 28 minutes, and 39 seconds, the exact time calculated. When voice contact was regained, Lovell announced, "Please be informed, there is a Santa Claus", to which Ken Mattingly, the current CAPCOM, replied, "That's affirmative, you are the best ones to know." The spacecraft began its journey back to Earth on December 25, Christmas Day. Later, Lovell used some otherwise idle time to do some navigational sightings, maneuvering the module to view various stars by using the computer keyboard. However, he accidentally erased some of the computer's memory, which caused the Inertial Measurement Unit (IMU) to think the module was in the same relative position it had been in before lift-off and fire the thrusters to "correct" the module's attitude. Once the crew realized why the computer had changed the module's attitude, they realized they would have to re-enter data that would tell the computer its real position. It took Lovell ten minutes to figure out the right numbers, using the thrusters to get the stars Rigel and Sirius aligned, and another 15 minutes to enter the corrected data into the computer. Sixteen months later, Lovell would once again have to perform a similar manual re-alignment, under more critical conditions, during the Apollo 13 mission, after that module's IMU had to be turned off to conserve energy. In his 1994 book, Lost Moon: The Perilous Voyage of Apollo 13, Lovell wrote, "My training [on Apollo 8] came in handy!" In that book he dismissed the incident as a "planned experiment", requested by the ground crew. In subsequent interviews Lovell has acknowledged that the incident was an accident, caused by his mistake. The cruise back to Earth was mostly a time for the crew to relax and monitor the spacecraft. As long as the trajectory specialists had calculated everything correctly, the spacecraft would re-enter two-and-half days after TEI and splashdown in the Pacific. On Christmas afternoon, the crew made their fifth television broadcast. This time they gave a tour of the spacecraft, showing how an astronaut lived in space. When they finished broadcasting they found a small present from Deke Slayton in the food locker: a real turkey dinner with stuffing, in the same kind of pack that the troops in Vietnam received. Another Slayton surprise was a gift of three miniature bottles of brandy, that Borman ordered the crew to leave alone until after they landed. They remained unopened, even years after the flight. There were also small presents to the crew from their wives. The next day, at about 124 hours into the mission, the sixth and final TV transmission showed the mission's best video images of the earth, in a four-minute broadcast. Once the Command Module was separated from the Service Module, the astronauts were committed to re-entry. Six minutes before they hit the top of the atmosphere, the crew saw the Moon rising above the Earth's horizon, just as had been predicted by the trajectory specialists. As they hit the thin outer atmosphere they noticed it was becoming hazy outside as glowing plasma formed around the spacecraft. The spacecraft started slowing down and the deceleration peaked at 6 g (59 m/s2). With the computer controlling the descent by changing the attitude of the spacecraft, Apollo 8 rose briefly like a skipping stone before descending to the ocean. At 30,000 feet (Template:Convert/round km) the drogue parachute stabilized the spacecraft and was followed at 10,000 feet (Template:Convert/round km) by the three main parachutes. The spacecraft splashdown position was officially reported as Template:Coord in the North Pacific Ocean south of Hawaii. When it hit the water, the parachutes dragged the spacecraft over and left it upside down, in what was termed Stable 2 position. About six minutes later the Command Module was righted into its normal apex-up splashdown orientation by the inflatable bag uprighting system. As they were buffeted by a 10-foot (Template:Convert/LoffAonSon) swell, Borman was sick, waiting for the three flotation balloons to right the spacecraft. It was 43 minutes after splashdown before the first frogman from the USS Yorktown arrived, as the spacecraft had landed before sunrise. Forty-five minutes later, the crew was safe on the deck of the aircraft carrier. Apollo 8 came at the end of 1968, a year that had seen much upheaval in the United States and most of the world. Even though the year saw political assassinations, political unrest in the streets of Europe and America, and the Prague Spring, Time magazine magazine chose the crew of Apollo 8 as their Men of the Year for 1968, recognizing them as the people who most influenced events in the preceding year. They had been the first people ever to leave the gravitational influence of the Earth and orbit another celestial body. They had survived a mission that even the crew themselves had rated as only having a fifty-fifty chance of fully succeeding. The effect of Apollo 8 can be summed up by a telegram from a stranger, received by Borman after the mission, that simply stated, "Thank you Apollo 8. You saved 1968." One of the most famous aspects of the flight was the Earthrise picture that was taken as they came around for their fourth orbit of the Moon. This was the first time that humans had taken such a picture whilst actually behind the camera, and it has been credited with a role in inspiring the first Earth Day in 1970. It was selected as the first of Life magazine's 100 Photographs That Changed the World. Apollo 11 astronaut Michael Collins said, "Eight's momentous historic significance was foremost"; while many space historians, such as Robert K. Poole, see Apollo 8 as the most historically significant of all the Apollo missions. The mission was the most widely covered by the media since the first American orbital flight, Mercury-Atlas 6 by John Glenn in 1962. There were 1200 journalists covering the mission, with the BBC coverage being broadcast in 54 countries in 15 different languages. The Soviet newspaper Pravda featured a quote from Boris Nikolaevich Petrov, Chairman of the Soviet Interkosmos program, who described the flight as an "outstanding achievement of American space sciences and technology". It is estimated that a quarter of the people alive at the time saw—either live or delayed—the Christmas Eve transmission during the ninth orbit of the Moon. The Apollo 8 broadcasts won an Emmy Award, the highest honor given by the Academy of Television Arts & Sciences. Madalyn Murray O'Hair, an atheist, later caused controversy by bringing a lawsuit against NASA over the reading from Genesis. O'Hair wished the courts to ban American astronauts—who were all government employees—from public prayer in space. Though the case was rejected by the Supreme Court of the United States for lack of jurisdiction, it caused NASA to be skittish about the issue of religion throughout the rest of the Apollo program. Buzz Aldrin, on Apollo 11, self-communicated Presbyterian Communion on the surface of the Moon after landing; he refrained from mentioning this publicly for several years, and only obliquely referred to it at the time. In 1969, the United States Postal Service issued a postage stamp (Scott catalogue #1371) commemorating the Apollo 8 flight around the Moon. 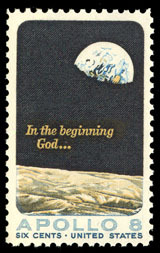 The stamp featured a detail of the famous photograph of the Earthrise over the Moon taken by Anders on Christmas Eve, and the words, "In the beginning God ..." Just 18 days after the crew's return to Earth, they were featured during the 1969 Super Bowl pre-game show reciting the Pledge of Allegiance prior to the national anthem being performed by Anita Bryant. Apollo 8's historic mission has been shown and referred to in several forms, both documentary and fiction. The various television transmissions and 16 mm footage shot by the crew of Apollo 8 was compiled and released by NASA in the 1969 documentary, Debrief: Apollo 8, which was hosted by Burgess Meredith. In addition, Spacecraft Films released, in 2003, a three-disc DVD set containing all of NASA's TV and 16 mm film footage related to the mission including all TV transmissions from space, training and launch footage, and motion pictures taken in flight. Portions of the Apollo 8 Mission can be seen in the 1989 documentary For All Mankind, which won the Grand Jury Prize Documentary at the Sundance Film Festival. The Apollo 8 mission was well-covered in the 2007 British documentary In the Shadow of the Moon. Portions of the Apollo 8 mission are dramatized in the 1998 miniseries From the Earth to the Moon episode "1968". The S-IVB stage of Apollo 8 was also portrayed as the location of an alien device in the 1970 UFO episode "Conflict". At the Kennedy Space Center Visitor Complex's Apollo/Saturn V Center, the history of the U.S. space program leading up to the launch of Apollo 8 is the subject of a multi-screen multimedia presentation which also features the actual control panels used in the Firing Room for the launch. ↑ Template:Cite book Chapter 9.5. ↑ Woods, W. David; O'Brien, Frank (April 22, 2006). "Day 1: Earth Orbit and Translunar Injection". Apollo 8 Flight Journal. NASA. Archived from the original on February 18, 2008. https://web.archive.org/web/20080218181006/http://history.nasa.gov/ap08fj/02earth_orbit_tli.htm. Retrieved February 7, 2008. ↑ "Saturn S-IVB-503N - Satellite Information". Satellite database. Heavens-Above. http://www.heavens-above.com/SatInfo.aspx?satid=3627&lat=0&lng=0&loc=Unspecified&alt=0&tz=UCT. Retrieved 2013-09-23. ↑ Template:Cite book Sec.2, Ch.3. ↑ Woods, W. David; O'Brien, Frank (2006). "Day 1: The Green Team and Separation". Apollo 8 Flight Journal. NASA. http://history.nasa.gov/ap08fj/03day1_green_sep.htm. Retrieved October 29, 2008. TIMETAG 003:42:55. ↑ 25.0 25.1 25.2 Woods, W. David; O'Brien, Frank (April 22, 2006). "Day 1: Maroon Team". Apollo 8 Flight Journal. NASA. Archived from the original on January 7, 2008. https://web.archive.org/web/20080107002315/http://history.nasa.gov/ap08fj/04day1_maroon.htm. Retrieved February 4, 2008. ↑ Woods, W. David; O'Brien, Frank (April 22, 2006). "Day 2: Green Team". Apollo 8 Flight Journal. NASA. Archived from the original on March 11, 2008. https://web.archive.org/web/20080311114001/http://history.nasa.gov/ap08fj/06day2_green.htm. Retrieved January 30, 2008. ↑ Kozlovskaya, Inessa B; Bloomberg, Jacob J.; Layne, Charles S. (2004). "The Effects of Long-Duration Space Flight on Eye, Head, and Trunk Coordination During Locomotion". Life Sciences Data Archive. Lyndon B. Johnson Space Center. LSDA Exp ID: 9307191. http://lsda.jsc.nasa.gov/scripts/experiment/exper.aspx?exp_index=747. Retrieved June 28, 2013. ↑ 31.0 31.1 Woods, W. David; O'Brien, Frank (April 22, 2006). "Day 3: The Black Team - Approaching the Moon". Apollo 8 Flight Journal. NASA. Archived from the original on February 4, 2008. https://web.archive.org/web/20080204015340/http://history.nasa.gov/ap08fj/11day3_black_approach.htm. Retrieved February 7, 2008. ↑ 32.0 32.1 32.2 "Apollo 8". National Space Science Data Center. NASA. http://nssdc.gsfc.nasa.gov/nmc/masterCatalog.do?sc=1968-118A. Retrieved June 28, 2013. ↑ 33.0 33.1 33.2 33.3 Woods, W. David; O'Brien, Frank (April 22, 2006). "Day 4: Lunar Orbits 1, 2 and 3". Apollo 8 Flight Journal. NASA. Archived from the original on September 22, 2007. https://web.archive.org/web/20070922045003/http://history.nasa.gov/ap08fj/13day4_orbits123.htm. Retrieved September 20, 2007. ↑ 35.0 35.1 35.2 Woods, W. David; O'Brien, Frank (April 22, 2006). "Day 4: Lunar Orbits 4, 5 and 6". Apollo 8 Flight Journal. NASA. Archived from the original on October 2, 2007. https://web.archive.org/web/20071002204030/http://history.nasa.gov/ap08fj/14day4_orbits456.htm. Retrieved September 20, 2007. ↑ Woods, W. David; O'Brien, Frank (April 22, 2006). "Day 4: Final Orbit and Trans-Earth Injection". Apollo 8 Flight Journal. NASA. Archived from the original on January 16, 2008. https://web.archive.org/web/20080116172357/http://history.nasa.gov/ap08fj/16day4_final_orbit_tei.htm. Retrieved February 7, 2008. ↑ 44.0 44.1 Woods, W. David; O'Brien, Frank (April 22, 2006). "Day 6: The Maroon Team - Splashdown". Apollo 8 Flight Journal. NASA. Archived from the original on February 6, 2008. https://web.archive.org/web/20080206092307/http://history.nasa.gov/ap08fj/22day6_maroon_splash.htm. Retrieved February 4, 2008. ↑ "Apollo 8 Firsts". American Experience: Race to the Moon. Boston: PBS. September 22, 2005. Archived from the original on December 15, 2011. http://www.webcitation.org/63xszRXVh. Retrieved December 15, 2011. ↑ "Telecasts from Apollo 8". American Experience: Race to the Moon. Boston: PBS. September 22, 2005. Archived from the original on December 15, 2011. http://www.webcitation.org/63xrogvaG. Retrieved December 15, 2011. ↑ "O'Hair v. Paine, 397 U.S. 531". FindLaw. 1970. http://caselaw.lp.findlaw.com/cgi-bin/getcase.pl?court=US&vol=397&invol=531&friend=nytimes. Retrieved February 13, 2008. ↑ "1969 U.S. Postage Stamp Issues". 1847usa. http://www.1847usa.com/ByYear/1969.htm. Retrieved June 30, 2013. ↑ "Super Bowl Entertainment". National Football League. http://www.nfl.com/superbowl/history/entertainment. Retrieved February 21, 2012. ↑ "The Apollo 8 Command Module". Museum of Science and Industry. Archived from the original on October 14, 2007. https://web.archive.org/web/20071014061744/http://msichicago.org/exhibit/apollo/index.html. Retrieved February 4, 2008. ↑ "NASA Glenn Visitor Center". Cuyahoga County Public Library. Archived from the original on March 13, 2009. https://web.archive.org/web/20090313082506/http://ns.cuyahoga.lib.oh.us/researchinfo/specialists/family_fun.htm. Retrieved June 30, 2013. ↑ Template:Cite AV media Debrief: Apollo 8 was released as a bonus feature for the Discovery Channel's miniseries DVD release. ↑ "In the Shadow of the Moon". Sundance Institute. http://history.sundance.org/films/3669/in_the_shadow_of_the_moon. Retrieved June 30, 2013. Some or most of the information on this page came from NASA's website. 40x40px Wikimedia Commons has media related to Apollo 8.